Proper winterization of a swimming pool can make or break your swimming pool. Winter damage is costly, frustrating and time consuming. Having the right products on hand for the job and a great team behind you can ensure your pool opens up clean and unharmed the following spring. There are different covers for different applications. This first one is a leaf catcher. It can be used on aboveground and inground swimming pools and is ideally used with another cover underneath. Catch the leaves in the fall even before you put on your winter cover and remove early winter to prevent soggy leaves getting through. This enviro cover is also nice. A winner on aboveground pools it makes for a very clean opening. It keeps stuff on top and allows the water to pass through which also helps with water load on top of the cover. A safety cover is the cover for inground swimming pools. It does all of the above plus it provide an element of safety for kids, pets and wandering animals. For more info on safety covers check out our blog on this very topic ! This leaf bagger is a must have for leafy pools. It is an easy way to remove those pesky leaves in no time flat. A cover rake is a great tool for removing leaves from your solar blanket or winter cover. It neatly attaches to your pool for ease of use. Another great product for leaf removal. This net is designed to scoop leaves for easy removal. 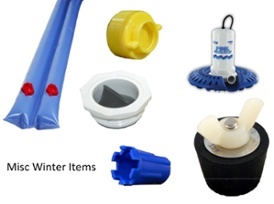 The perfect item to prevent ice from damaging your skimmer over the winter. If its damaged in the spring just replace and know you just saved yourself some serious money! Antifreeze is used in the return lines for inground pools and in pumps. Ensure you have a good quality brand like this Hibernate premium antifreeze from BioGuard. A triple action antifreeze, corrosion inhibitor and lubricator it is guaranteed to –50°F (-45°C)! Water bags for those who have a water bag cover. We have all these items and more in stock! Need us to close your pool? Want to learn how to close the pool yourself? Get your closing cheklist here! Register for our DIY Seminar! This made-to-order heatpump cover is becoming a hot item! Made locally, it is suitable for any heatpump of this shape but originally designed for the Titans and Omegas! Get your order in Now! as there is not too much time left for our local wonder to stitch one up for you! This made-to-order solar roller cover is going to be a hot item! Made locally, it is suitable for any solar blanket roller of this shape. Keep your blanket away from the elements this winter and support local! Get your order in Now! as there is not too much time left to stitch one up for you!